William Fletcher was born in 1872 in Leicestershire, England. He was the first scientist to determine, that if special factors (vitamins) were removed from food, disease occurred. Fletcher entered Caius College, Cambridge, in 1890, obtained a scholarship to St. Mary’s Hospital, Paddington, from which he qualified in 1896. He held a resident appointment at the Metropolitan Hospital, and then spent several years in general practice in Coventry before entering the Malayan Medical Service in 1903. 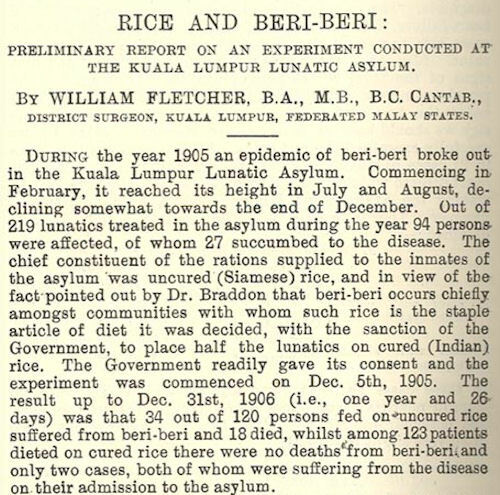 Doctor Fletcher was researching the causes of the disease Beriberi when he discovered that eating unpolished rice prevented Beriberi and eating polished rice did not. William Fletcher believed that there were special nutrients contained in the husk of the rice. However, it wasn't until 1912 that Polish scientist Cashmir Funk named those special nutrients "vitamines" after "vita" meaning life and "amine" from the vitamin thiamine. Later on the word was shortened to "vitamin." James Lind (1716 in Edinburgh – 1794 in Gosport) was the pioneer of naval hygiene in the Royal Navy. The number of sailors that died from mal-nutrition was a serious problem. While at sea in May 1747 he conducted what is regarded as the first ever clinical trial, he proved that citrus fruits could cure scurvy but he could not conclude why, but on an unofficial level sailors knew consuming fruits kept them healthy. Lind published his work in 1753 in his Treatise on the Scurvy. This is why USA-nians call us Limeys (Limes) and maybe why Australians call us Pomes (Pomegranates). 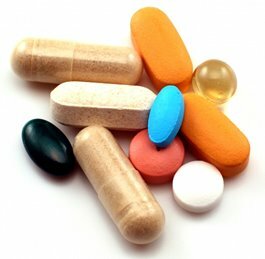 But Lind had made the link between vitamins and health almost 200 years before Fletcher.